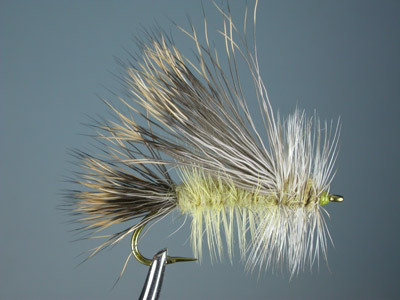 Following the story are three of Bob's favorite patterns. Bob works for the Defense Department and lives in Vermont with his wife and son and a chocolate lab named Baxter. Bob finds plenty of time for fishing and exploring, especially in Maine. Home of some great trout and salmon fishing, he is in the process of building a camp in Rangeley, Maine. When fishing (or dreaming of fishing), Robert Travers' quote frequently comes to mind: "I fish because I love to, because I live the environs where trout are found, which are invariably beautiful. My fascination with fly fishing and native brook trout began in Maine in 1962 at the age of 14 when a friend of my father took me on a week long trip to the West Branch of the Penobscot River. The West Branch was, and still is, one the premier landlocked salmon fisheries in the state. We would cross the river by canoe to fish the opposite shore near where Nesowadnehunk Stream enters from Baxter State Park. During a lull in the salmon action, I hiked quite a way up the stream and caught a beautiful 12" native brook trout in a crystal-clear pool. The hatchery trout I was used to catching paled in comparison to this fish. Looking back, that one fish was literally a turning point in my life. It opened my eyes to the "wilds" of Maine and to the outdoor traditions that have become such a big part of my life. In my twenties my emphasis was on backpacking and mountain climbing. But seven years ago a backpacking trip into the interior of Baxter State Park (home of Mt. Katahdin, the northern terminus of the Appalachian Trail), brought my focus back to fly fishing and the pursuit of native strains of trout and salmon. We took fly rods on that trip, because of the ponds we would be passing, and we found lots of innocent and eager brookies. It was September and they were all colored-up for spawning. I was back into fly fishing with a passion. After that experience, I fished, read, listened and absorbed as much as I could. A friend from work taught me how to tie and I jumped into that aspect of the sport with equal enthusiasm. A Maine event that I kept hearing about was the "drake hatch". 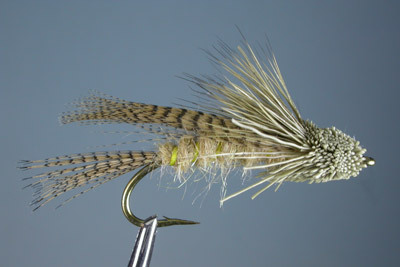 These huge mayflies hatch on stillwaters at dark around July 4th, and bring the biggest fish to the surface to feed. In recent seasons I have tried to catch the hatch, but with minimal success. Finally, last year on Nesowadnehunk (Sourdahunk) Lake, source of the stream mentioned above and home to one of the purest strains of brook trout in Maine, I finally hit it right. Sitting out in the canoe on the 300 acre lake with lots of company, I didn’t know what to expect. At dusk, I started hearing the first very audible rises. There they were, big cream colored duns struggling to emerge. It seemed it took forever for them to be capable of flight. Sitting ducks for the trout. The cove I was in came so alive, that it was very hard not to "flock shoot". But instead I concentrated on one fish at a time, trying to figure its feeding pattern and lead the cast to its next likely rise. Though drakes continue to hatch and fish continue to feed well after dark, there unfortunately was only enough time to hook a half-dozen or so fish before the legal time ended, one hour after sunset. But it was one of the most exciting 45 minutes I’ve ever experienced. 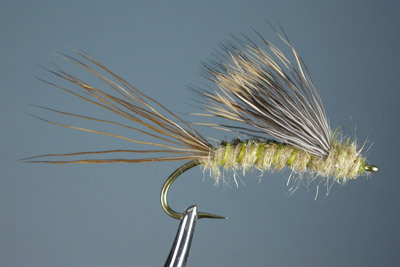 There are countless patterns out there for this hatch, but the ones I found most successful are simple emergers. I like to fish emergers on a sinking line, before the hatch begins. For fully emerged dun, a modified stimulator works well.